Human communication is such an intricate part of our lives. I have attempted to make my blog more then just about books. As many thoughtful people do, I have endeavored to explore our world a little bit through ideas. Literature, art, philosophy, science, etc. are all roads that we journey on in this exploration. One vehicle that we employ to journey these avenues is the act of discussion. Thus, I am devoting a few words to this vital activity. This post is not a “how – to” aimed at advising folks how to conduct discussions. My readers will no doubt have their own divergent opinions on this subject. There really is no right or wrong way to engage in dialogue. This is just a collection of some of my personal ruminations upon what I have found to be the most satisfying and enlightening way to talk about things. My family and friends will tell you that I am a talker. I love to chat, and very importantly, I do like to listen. After years and years of dialog with all kinds of people I have some ideas that I want to share. Today I will confine myself to examining discussions about things that do not have a direct and practical impact upon out lives. I am referring to discussions upon art, literature, philosophy, religion, politics etc. I will save the practical everyday stuff for another day. It is important to point out that I do not always engaged in the “perfect” discussions of the type that I will outline. I must admit that I have from time to time I have become involved in wildly undisciplined and/or heated exchanges. Instead, I put this out as something of an ideal, but an ideal that sometimes, with the right people, can be achieved. Thus I have at times participated in such lofty conversations. We also read and hear lots exhortations directed at folks who are too quite, too afraid to express their opinions. Such advice urging folks to come out of their shells may indeed be worthy, but it has never been a problem for me or the people who are generally around me. Thus my ruminations will not encompass experiences of the too shy and the unexpressive. What many folks define as controversial subjects make for great conversations. When I am with good conversationalists who I either know, or who I sense are game for it, I love to engage in subjects such as religion and politics. There was a time when I was just as enthusiastic for such talks in most public situations and with anyone, especially if others opened the door and initiated the talk. However in recent years I find that society has become so uncivil, and so many people, at least in the United States, just parrot talking points, often aimed at antagonizing others. These “canned” arguments, sentences and phrases are created by various interests and permeate our airwaves. These days it seems that almost any group of random people includes those who are intolerant and dismissive to those who harbor differing views. I find that such people exhibit all forms of political and religious views. I firmly believe that one needs to be intellectually honest, thus I recognize people that there are lots of folks who mostly agree with me on issues such as religion and politics, but who are among the worst of the intolerant and close minded. There was a time that I enjoyed engaging and debating these people regardless of the side that they were on. As I get older however, I find that there is too little time or energy for wasted conversation where no one learns anything. I do love to chat with folks I disagree with, especially if they are calm and thoughtful conversationalists. When it comes to people who I have never delved into controversial waters with previously, I am never the first to initiate, as I feel that it is a bit too provocative to be the first one to jump into such pools. I welcome it when people initiate such talks with me however. I particularly enjoy it when folks begin to talk religion with me. I must point out that my gratification stemming from such an encounter is not that of some of my fellow non- believers who take such encounters as an excuse to begin bashing religion and mocking people. I know someone who claims that he “intellectual destroys” people who attempt to preach religion to him. Personally I do not posses such intellectual firepower to lay waste to folks whose views differ from mine. If I did, I certainly would gain nothing by carpet - bombing their viewpoints. Instead when someone begins to talk religion with me I do take it as an open door for me to express my own beliefs. I strive to do so respectfully and with reason. Just as importantly I also take pains to listen and try to understand the other person’s beliefs. Of course this perfect conversation that I am setting up does not always come to be. I do recall one woman who, initially began to espouse the virtues of her religion to me. When I calmly and respectfully (I really treat these situations with kid gloves and go out of my way to listen, not to sound hostile, aggressive, dismissive or confrontational) expressed my belief concerning the existence of God, she literally ran from me. Many situations yield great results however. I have had insightful and enlightening conversations with folks arising out of these encounters. I recall a few years ago during a hospital stay having a roommate who was a lay minister who began to talk religion with me. I sensed that he was a little taken aback when I told him that I was a non - believer. However we proceeded to have a fascinating conversation for hours, on multiple topics relating to religion. The nature and tone of this talk actually led to very little debate. I am beginning to me more and more skeptical of debate for what I would describe as “debate’s sake. “ I do concede that when an idea is too easily accepted by society or the powers that be, playing devil’s advocate may be very useful. However, except for such fairly uncommon situations, our society, from the mass media all the way down to individuals, is teeming with people who have decided that argument is such a good thing that it should be initiated whenever possible and in defense of any position. Sometimes it is driven by the need to oppose certain politicians, public figures and groups. Folks take on positions just to be in opposition to public figures. In my opinion, this is a terrible way to reach truth or understanding. Of course I am not arguing against all debate. Such a contention would be sillier then the ceaseless argument for the sake of argument that I am complaining about. However, in my opinion the most fruitful debates spontaneously sprout within thoughtful conversations that also involve a fair amount of agreement. Furthermore they are not exercises in showing up one’s opponent through superior verbal and debating skills. A good debate under the right conditions will illustrate one’s reasoning and highlight a different way of looking at things to one’s counterpart. The pure debate format seems to be such a flawed way to communicate. Rhetorical skills take precedence over truth and wisdom. Parties are loath to admit that agree or to see eye to eye on particular points even when they inwardly would have come to a consensus. Once again, I must emphasize that I am not arguing against spirited and even contentious dialogue. Instead I am arguing that disagreements should arrive naturally and that discussions should not be contests where the participants fear to agree on anything due to the danger of “losing” the argument. Of course civility and respect are also key components. So what are the elements of my ideal conversation? It would involve two or three people who were not afraid to express their views but who are very civil. Folks would delve into controversial areas fearlessly. Such intellectual boldness actually is encouraged by such politeness. People will carefully listen to one another. Areas that people agree upon will be explored and delved into further. Areas that people disagree on will spark debate and further discussion. If folks feel the need to parrot a popular line that they heard in the media they should acknowledge that they are doing so and explain why it particularly rings true to them. The above represents a perfect situation that can never really be achieved, at least not consistently. I have not always, and will likely not always engage in discussions that adhere to the above format. Furthermore many of my readers will have different ideas as to what elements constitute great conversation. This is not just an intellectual exercise however. If I understand what kind of talk yields the most enlightening and fulfilling results, it can help me to seek out people as well as create situations conducive to such communications. The end result is a ultimately better way to intellectually explore the Universe. My commentary contains major spoilers. I have revealed significant aspects of the book’s conclusion in order to make some of my points. We, by Yevgeny Zamyatin, is one of the earliest dystopian novels. I recently read the Clarence Brown translation. Written in the Soviet Union in 1921, it precedes such important works such as George Orwell’s Nineteen Eighty - Four and Aldous Huxley’s Brave New World. Both of those and many other “Oppressive Future” novels draw heavily in terms of plot, characters and theme from this work. 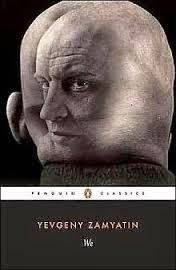 Set in the 26th century, Zamyatin has created a world where the oppressive One – State, ruled by a paternalistic figure known as “The Benefactor,” controls a society whose goal is to stamp out individuality, freedom and genuine emotion. A major tenet of the dictatorship is that it is supposedly based on science and pure rationality. A two hundred year war has ended within the last century. Clues in the narrative indicate that a mechanistic, over controlling, city - based faction defeated a rural-based, naturalistic faction. One - State, a highly technological urban society, is now separated from the undeveloped, natural world by a seemingly impenetrable wall. Descendants of the survivors of the losing side live in relatively primitive conditions outside of the wall. This dark future was clearly influenced by Zamyatin’s reaction to living under Communist oppression. Our narrator is known as D – 503. He is an engineer who is chief designer of One - State’s first starship, known as the Integral. The narrative is presented in the form of D – 503’s journal. Relationships form a key part of the novel. Sexual and romantic relations in One – State are basically on demand, with anyone having the right, upon request, to sexual relations with anyone else. Initially D – 503, his poet friend R – 13 and a woman, O – 90, are involved in a romantic triangle. The three are emotionally close and there seems to be minimal jealousy involved. Enter I -330, a woman who aggressively pursues D – 503. I – 330 is charismatic, bold and independent, but also controlling and manipulative. She turns out to be the leader of a rebel movement whose goal is the overthrow of One - State. She plans to steal the Integral and use it against the powers that be. Throughout the story, D – 503 is constantly wavering between his loyalty to One – State and the belief system that goes with it, and his increasing obsessive feelings for I – 330. Philosophically, Zamyatin goes into some interesting directions here. The oppressiveness inherent in the society that he has fashioned is largely driven by a wildly overzealous belief in science and rationalism, at the expense of nature, natural behavior, authentic feelings and individuality. Personally, I believe that twenty-first century popular and political culture tends to unfairly demonize rationality and logical thinking at the expense of unthinking feelings and intuition. I believe that our current world would only benefit from more rationality and logical thought. Of course, this book was not written by a person living in a twenty - first century westernized nation as I do. The Russia that Zamyatin was living in was horrendously oppressive and operated under the pretension of super rationality that was supposedly leading down a path ending in ultimate human happiness. Like many generally positive things, supposedly logical ideologies, when taken too far, and when forced upon people, can lead to not just bad, but monstrous results. Communist Russia was but one example. Thus, Zamyatin’s book serves as a warning that needs to be heeded, even by those of us who champion rationality. In the end, the author seems to be illustrating what he believes to be a timeless and universal struggle between the forces of naturalism verses the forces of logic. Both sides win victories, and there are great triumphs as well as disheartening defeats. The book ends with D – 503 giving in to his conformist instincts and voluntarily betraying the rebellion as well as I – 330. For her part, I – 330 valiantly resists torture and gains a great moral victory, but she will presumably be executed. The rebels have seized control of large parts, but not all, of One – State. The civil war rages on with no clear victor apparent. Zamyatin makes another interesting ideological connection between the operation, ideology and oppressiveness of One - State, and the history and ideology surrounding Christianity. On several occasions both D – 503 and I – 330 identify Christianity as a precursor to One - State. Parallels are drawn between the two belief systems in the shared messianic messages, the end result of a final, perfect happiness for mankind, as well as progress and eventual happiness through suffering. Others have connected Christian thought and Communist ideology. Recently, is his The Better Angels of Our Nature: Why Violence Has Declined, Steven Pinker spells out many similarities, including those highlighted by Zamyatin. I believe that Communist thought systems have borrowed from Christian thought systems in ways that both authors have illustrated. However, in all fairness, Christian belief can in no way, except perhaps by its worst excesses, be blamed for the fact that Communist ideology was influenced by it. This novel is an extremely important and influential work. It has affected so much of what has come since. It is also an extremely enjoyable read, filled with interesting characters that engage in interesting relationships and thoughts. As usual, there is a lot more here than I have touched upon. I have only focused upon a few points that I found thought provoking. There are many more. This is a must read for anyone interested in the included themes, science fiction in general or in dystopian literature. 05/24/14 - I made some minor edits to the above in order to correct a certain error I originally made in regards to Russian history. There is something about immersing oneself in an intricately detailed book. 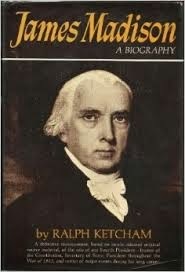 I am currently reading James Madison: A Biography by Ralph Ketcham. I will use this as an example. This biography is 671 pages long, not including endnotes. These 671 pages are not conventional pages. They are large and dense. I would estimate that had this book been formatted like most books, it would run well over one thousand pages. The work goes into minute examinations and analyses of all sorts of topics concerning both Madison and his period and place. For instance, Madison’s time studying at the College of New Jersey, now Princeton University, is covered in great depth. Examining these years in Madison’s life is indeed important, as several of America’s Founders attended this institution during this time. The philosophy and theology espoused and taught there by its president, John Witherspoon at that time, had a significant impact on these men as well as upon the Revolution itself. Though the College of New Jersey figured somewhat importantly in other works that I have read concerning this era, none has delved as deeply as Ketcham’s book. Other authors, including the biographers of other attendees, have appropriately emphasized the college’s influence, but have provided only a fraction of information that this work does. This book explores and analyzes the philosophy, politics and theology, in serious detail, to which Madison and others were exposed. It devotes many pages to the actual works of the philosophers and historians that were taught and that Madison read. Finally, Ketcham even describes living arraignments, dietary habits, student hijinks, etc., that characterized attendance at the school. This is just one chapter in a twenty-two-chapter book. I must point out that The American Revolutionary period is my “thing.” Approximately twenty percent of all of my reading is dedicated to the subject. I intentionally chose Ketcham’s book over shorter and less detailed biographies because I hungered for the detail. In my younger days this is the kind of book that I would begin, make it through a hundred or so pages, become bored and never finish. I can say with confidence that, being about two hundred pages in at the time of this writing, I will not only finish, but I will enjoy every page. As I have gotten older, I have changed. When it comes to reading, at least, I have developed much patience. I have learned that reading and learning is a journey and not a means to a destination. Furthermore, a certain type of curiosity has grown in me. Not just the curiosity derived from wanting to know about a person like Madison and his times, but a curiosity to understand and ponder the details, the real nitty-gritty stuff, concerning various subjects. I now take great joy in drilling deep down like this. I believe that for a serious reader, detailed and intricate reading of this sort is essential. Of course, I would not look to read such a book on just any topic. For instance, lately I have been delving just a wee bit into literary criticism and theory. I wanted to get a basic introduction on that subject and maybe read some seminal works. I would never look for this much depth on that or on many other topics. However, as I mentioned, the American Revolutionary era is a kind of life concentration for me. Furthermore, Madison is a vital figure out of this time and place, one who, to some extent, I have neglected until now. Compared to most history books, this one obviously embodies great depth. Though this is the sort of book that one might only read occasionally, I think that this sort of book really should be read occasionally. There are, of course, other areas where I yearn to dig as deep. Certain forms of literature and philosophy come to mind. Part of the challenge is picking and choosing. Sadly, there is insufficient time in life to delve into everything that I want to at this level. Thus, I have made conscious decisions to stay closer to the surface in some areas. As it is, I feel that I am not devoting enough reading time to the areas that I want to. I must limit my interests! The joys of such meticulous works are understandably not something that everyone will appreciate. For a good chunk of my life, I found it impossible. I can attribute my ability to tackle such books partially as the result of getting a little older. However, I observe lots of younger people who, unlike the way that I was, are prepared for such intellectual challenges without needing to wait. I for one am glad that I have evolved to this point. As the old saying goes, better late then never!